Google approached Retail Service Partner to ensure the Chromebook displays in Media Markt have a premium appearance at all times. 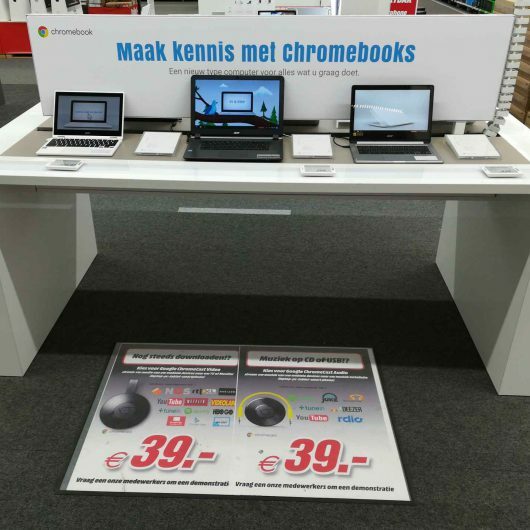 Google has Chromebook displays in twenty Media Markt branches, which show the most important Chromebook models. The goal of these displays is to give shoppers a premium experience of the Chromebook platform. The demo setup is used a lot by shoppers, and must therefore also have the same premium appearance. Together with Google, RSP mapped out the requirements and wishes. We also gave advice about the work needed to maintain the premium appearance. Google’s information needs were discussed and a report prepared, which contained the right information and set out action points. RSP was given the responsibility of supplying several Chromebook showcase models for each table based on a display plan. The merchandiser monitors the security, the presence of the correct specification cards and correct price cards, and is responsible for ensuring the table is left neat and tidy. The showcase models are also provided with a demo mode, which must be running during opening hours. Retail Service Partner checks these specific points each day and makes adjustments where necessary. All these activities are reported directly to Google each week, based on a specific report prepared together with the client. The result is a neat and tidy display with a premium experience that is constantly kept up to date. Action points that arise are communicated to the client directly via a ticket, so that they can be resolved quickly.